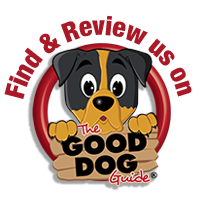 “I first began using East Anglian Dog Training a year ago in order to train my young puppy who was 12 weeks old. I found the classes informative, straightforward and fun. Jo Marshall is professional and knowledgeable and happy to help with any individual needs or worries. I also use the dog walking and dog sitting services which are available. As a mother of two small children there are days when walking my dog is difficult due to illness, work commitments, days out etc. With East Anglian Dog Training I can rest assured that I can rely on Jo or Amy to collect my dog and look after him for a couple of hours or a whole day. Such is my confidence and trust that they have a door key in case I have to leave before the collection time. The prices are competitive and the service excellent. I have booked my dog for overnight stays many times and he always returns happy and healthy. “Having looked at other boarding options, I decided that a more personal approach would be better instead of kennels as Trig, my 10m old StaffyX is really clingy and can suffer from separation anxiety. Not having boarded him before, I had a few concerns regarding his behaviour. Only having adopted him three months previous I was not only unsure how he would react being separated from the family but also how he would react/behave towards other people, places and dogs. I explained all of his foibles to Jo and after a meeting to assess his behaviour we had him booked in for a weekends boarding. The process was simpler than I thought, I made the booking, filled out an emergency contact/medical form and waited for the date to come around. Any pre-boarding enquiries I had (I had quite a few as a first timer! ), were answered promptly and comprehensively. Seeing him go off was a little sad, however, I shouldn’t have worried. When the time came to collect him…He didn’t want to leave! Some of the people who wrote these lovely comments are happy to be contacted to give a personal recommendation, please let us know if you would like to speak with a current customer and we can get you in touch with them.